How’d He Do? Score Bruce’s Predictions for SEO and Internet Marketing in 2012 was originally published on BruceClay.com, home of expert search engine optimization tips. Calling all online marketers! We need your input to get a good picture of what happened in the Internet marketing industry last year. We’re hoping you have a minute to grade Bruce’s predictions from last year. Every year Bruce reads trends and past events to forecast the Internet marketing industry in the year ahead. 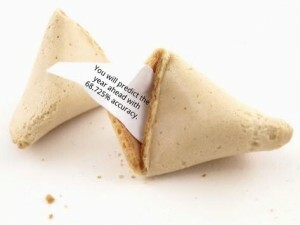 Predicting major happenings in the search marketing industry for the year to come is a fun tradition we do every year. But now it’s time to get critical and see how accurate he was. Will you score Bruce? Did you see these predictions play out, or were they in the ballpark or total misses? We’ll be publishing Bruce’s final scorecard for his 2012 predictions in the SEO Newsletter next week and can use all the graders we can get. We’d be grateful if you could share this survey with your networks, too. Check out all of Bruce’s 2012 Internet marketing industry predictions published in the January 2012 SEO Newsletter. Select all the answers you agree with for each of the 6 questions below.